Everything on this card fits very well together, love the Designpaper ! 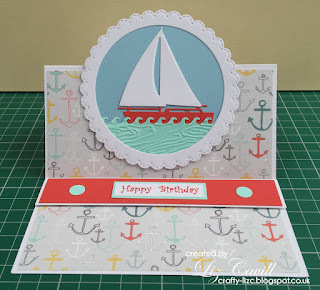 Wonderful Easel Card and also her this very matching design paper, very nice ! Here I like bright colors and the FUN arrangement from the Globe, Ship and Airplane ! Thanks for featuring my card and of course congratulations to Liz and Hazel.